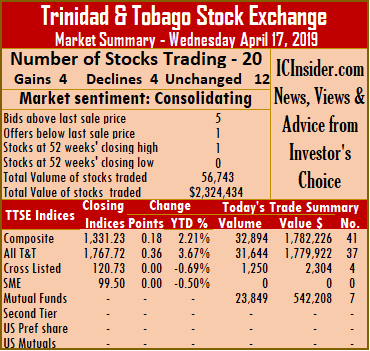 Market activity on the Trinidad & Tobago Stock Exchange ended on Thursday with 18 securities changing hands against 13 on Wednesday, with 4 advancing, 4 declining and 10 remaining unchanged. At close of the market, the Composite Index gained 0.63 points to end at 1,310.23. 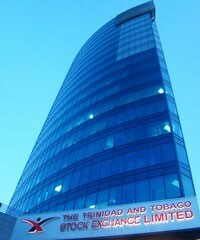 The All T&T Index rose 0.51 points to 1,710.58, while the Cross Listed Index inched 0.10 points higher to close at 122.93. Trading ended with 414,470 shares at a value of $4,718,365, compared to 382,241 shares at a value of $9,662,035 on Wednesday. IC bid-offer Indicator| The Investor’s Choice bid-offer ended at 6 stocks with bids higher than their last selling prices and 1 with a lower offer. Stocks closing with gains | First Citizens gained 2 cents and ended at $34.22, after exchanging 9,092 shares, Sagicor Financial rose 1 cent and ended at $10, after trading 80,900 shares. 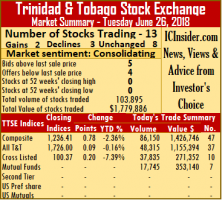 Trinidad Cement closed with a gain of 5 cents at $2.55, with 1,091 shares changing hands and West Indian Tobacco gained 19 cents and completed trading of 10 stock units at $95.75. Stocks closing with losses| Clico Investments fell 2 cents and completed trading with 33,175 stock units at $20.14, Massy Holdings share fell 1 cent and ended at $48, after exchanging 277 shares. NCB Financial Group shed 5 cents to end at $8.40, after exchanging 183,268 shares and Republic Financial Holdings lost 1 cent in closing at $108, after exchanging 692 shares. Stocks closing firm | Agostini’s ended at $23.30, after exchanging 10 shares, Grace Kennedy completed at $3.10, with 400 stock units changing hands, Guardian Holdings settled at $18, with the trading of 84 units, JMMB Group ended at $1.75, after exchanging 11,759 shares, LJ Williams B Share closed at 70 cents, after exchanging 13,200 shares. National Enterprises completed trading at $8, with 10 stock units changing hands, National Flour settled at $1.65, with 38,557 units trading, Point Lisas completed trading 1,245 stock units at $3.45, Prestige Holdings settled at $7.35, trading 200 units and Trinidad & Tobago NGL settled at $29.50, with 40,500 units changing hands. Trading on the Trinidad & Tobago Stock Exchange dipped on Monday with volume and value of stocks trading down on Friday levels. The market closed with 12 securities changing hands, compared to 15 on Friday, with just 67,372 shares at a value of $1,823,304 changing hands, compared to 971,051 units at a value of $11,872,964 on Friday. Market activity closed, with stocks 3 advancing, 1 declining and 8 remaining unchanged. At the close, the Composite Index rose 0.99 points on Monday to 1,304.19. 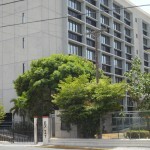 The All T&T Index added 0.64 points to end at 1,704.27, while the Cross Listed Index rose 0.18 points to close at 122.16. 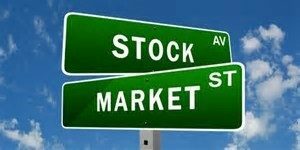 Stocks closing with gains| First Citizens finished 3 cents higher to settle at $33.85, after exchanging 2,623 shares, Massy Holdings concluded trading of 1,000 shares and rose 29 cents to close at $47.49 and Sagicor Financial gained 21 cents to $9.02, after trading 9,500 shares. Stocks closing with losses| Clico Investments closed with a loss of 1 cent to end at $20.16, with 3,150 stock units changing hands. Stocks closing firm | Agostini’s concluded trading of 100 shares at $23.20, Angostura Holdings ended at $16.05, with 11,464 stock units changing hands, Calypso Macro Index Fund ended trading of 1,600 stock units at $13.50, Guardian Holdings completed trading at $18, with 8,899 units. 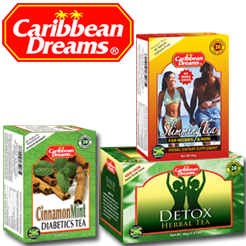 National Enterprises ended at $8, with 15,000 stock units changing hands, Prestige Holdings completed trading of 1,000 units at $7.35, Trinidad & Tobago NGL traded 3,036 units at $29.14 and West Indian Tobacco closed at $95.40, with 10,000 stock units changing hands. 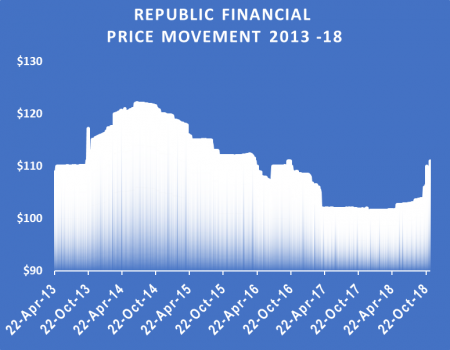 Republic Financial climbed $1 to a 52 weeks’ high of $111 and West Indian Tobacco rose 30 cents on the Trinidad & Tobago Stock Exchange on Tuesday and remained poised for more gains. 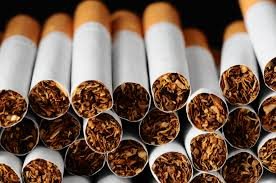 West Indian Tobacco closed higher slightly higher but closed with the bid at $94.20 to buy 3,950 shares with none on offer at the close, as investors respond to improved results and a pending stock split. Market activities ended with 16 securities trading versus 12 on Monday, 8 advancing, 5 declining and 3 remaining unchanged. The market closed with one stock trading at 52 weeks’ high and two at 52 weeks’ low as 135,571 units valued at 824,024 traded, compared to 449,177 units valued at 8,056,501 changing hands on Monday. The Composite Index climbed 3.03 points to 1,251.43. The All T&T Index rose 4.81 points to 1,715.01, while the Cross Listed Index rose 0.16 points to close at 106.05. IC bid-offer Indicator| At the end of trading, the Investor’s Choice bid-offer indicator reading closed with 3 stocks ending with higher bids than the last selling prices and 2 with lower offers. Stocks closing with gains| Clico Investments ended trading with a rise of 20 cents to close at $20.20, with 3,205 stock units changing hands, First Citizens finished 26 cents higher and completed trading at $33, after exchanging 4,061 shares, JMMB Group concluded trading of 105,700 shares and gained 8 cents to settle at $1.80, National Flour added 6 cents and ended at $1.68, with 500 units trading, Republic Financial Holdings gained $1 in settling at $111, after exchanging just 10 shares. 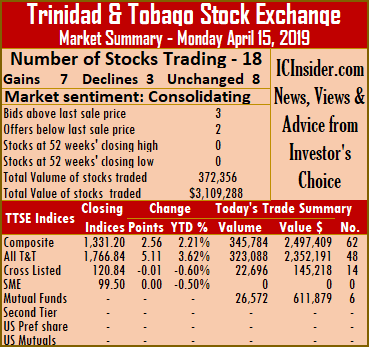 Trinidad & Tobago NGL increased 1 cent and completed trading at $29.51, after exchanging 8,284 shares, Trinidad Cement rose 5 cents and settled at $2.70, exchanging 4,100 shares and West Indian Tobacco closed with a gain of 30 cents and ended at $94.50 trading 245 units. Stocks closing with losses|Agostini’s lost 20 cents and settled at $23.20, after exchanging 421 shares, Angostura Holdings ended trading 10 cents lower at $15.60, with 64 stock units changing hands, Massy Holdings concluded trading of 1,269 shares with a loss of 17 cents to close at $46.83, Prestige Holdings traded with a loss of 20 cents and ended at a 52 weeks’ low of $7.30, with 1,000 units and Sagicor Financial closed with a loss of 1 cent and ended at a 52 weeks’ low of $7.39, with 2,050 stock units changing hands. 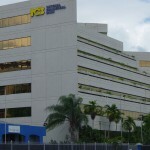 Stocks trading with no price change| National Enterprises closed at $8.44, with 100 stock units changing hands, NCB Financial Group completed trading at $6.50, after exchanging 3,949 shares and Scotiabank ended at $64.50, as just 613 units changing hands. 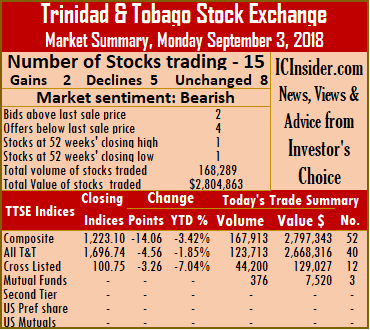 Stocks mostly rose in trading on the Trinidad & Tobago Stock Exchange on Friday, with the price of 6 security rising, 4 declining and 8 remaining unchanged. The market ended trading of 276,756 shares at a value of $7,002,384 compared to 143,335 shares at a value of $2,574,472 changing hands on Thursday and ended with 18 securities changing hands, similar to the number trading on Thursday. Trading closed, with the Composite Index declining 1.51 points to 1,233.15, the All T&T Index rose 1.10 points to 1,700.08, while the Cross Listed Index declined 0.57 points to close at 103.06. IC bid-offer Indicator| At the end of trading, the Investor’s Choice bid-offer indicator reading closed with 5 stocks ending with higher bids than the last selling prices and 3 with lower offers. 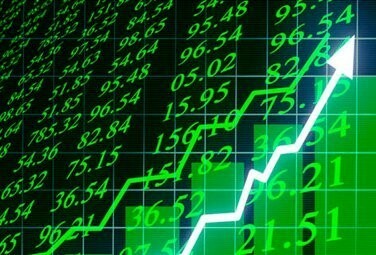 The market closed with a number of stocks exhibiting a posture for moving higher in the days ahead, the group are, Agostini’s, Ansa McAl, Republic Holdings, Point Lisas, Trinidad and Tobago NGL and West Indian Tobacco with a 3 for 1 stock split to come to make the stock more attractive for investors to trade. Stocks closing with gains| Clico Investments gained 35 cents and ended at $20.35, with 525 stock units changing hands, Guardian Holdings added 2 cents and completed trading of 500 units at $16.92, National Enterprises increased 4 cents and ended at $9.01, with 770 stock units changing hands, Republic Financial Holdings rose 5 cents and ended trading at $106, after exchanging 48,007 shares, Scotiabank closed with a gain of 5 cents in trading 3,700 units at $64.85 and Trinidad & Tobago NGL gained 10 cents and settled at $29.50, exchanging 1,000 shares. Stocks closing with losses| First Caribbean International Bank traded with a loss of 10 cents at $8.40, trading 7,500 units, First Citizens fell 7 cents and settled at $32.68, after exchanging 4,135 shares, Prestige Holdings closed with a loss of 4 cents and completed trading 2,663 units at a 52 weeks’ low of $7.50 and Sagicor Financial shed 14 cents and ended at $7.55 with 70,472 stock units changing hands. Stocks trading with no price change| Angostura Holdings ended at $15.75, with 500 stock units changing hands, Ansa Merchant settled at $38.25, after exchanging 3,000 shares, Calypso Macro Index Fund traded 800 shares to close at $15.81, JMMB Group ended at $1.63, after exchanging 7,500 shares, National Flour completed trading at $1.70, with 15,928 units changing hands, NCB Financial Group settled at $6.15, after exchanging 108,531 shares, Trinidad Cement concluded at $2.70, in exchanging 962 shares and West Indian Tobacco completed trading of 263 units at $90. 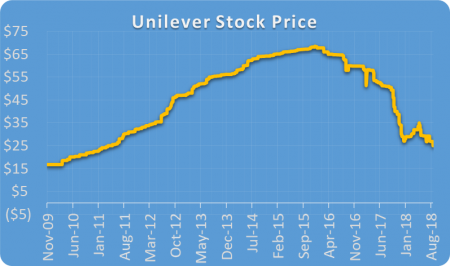 The collapse of Unilever share price. 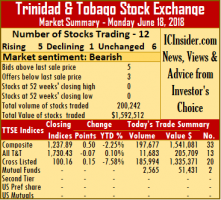 After closing for the Independence holiday on Friday, the Trinidad & Tobago Stock Exchange got shook up, with sharp decline in the prices of a series of securities in trading on Monday. When the market closed, First Citizens lost 84 cents and completed trading at $34.01, after exchanging 5,443 shares, Massy Holdings fell 90 cents and closed at $47, trading 1,101 shares, NCB Financial Group lost 47 cents and completed trading of 3,590 shares at $5.67, Scotiabank dropped 64 cents to end at $64.36, trading 1,460 units and Unilever Caribbean closed with 3,450 shares changing hands as the price dropped $1.75 to end at $25, the lowest price since May 11, 2011. The market closed with 15 securities changing hands against 18 on Thursday, 2 advanced, 5 declined and 8 remained unchanged and trading of 168,289 shares at a value of $2,804,863, compared to 1,412,439 shares at a value of $53,377,248, previously traded. 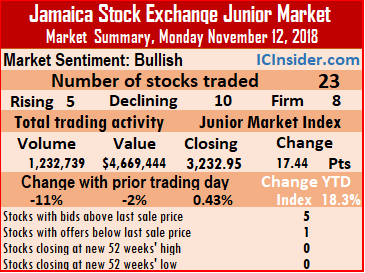 At close of the market the, Composite Index the Composite Index dropped 14.06 points to 1,223.10, the All T&T Index declined 4.56 points to 1,696.74, while the Cross Listed Index lost 3.26 points to close at 100.75. IC bid-offer Indicator| At the end of trading, the Investor’s Choice bid-offer indicator reading closed with 2 stocks ending with higher bids than the last selling prices and 4 with lower offers. Stocks closing with gains| JMMB Group added just 1 cent to settle at $1.71, after exchanging 7,633 shares and Republic Financial Holdings gained 2 cents settled at a 52 weeks’ high of $103.52, after exchanging 10 shares but closed with the bid at $105 to buy just 10 units. Stocks trading with no price change| Agostini’s settled at $21.11, after exchanging 9,315 shares, Clico Investments closed at $20, with 376 stock units changing hands, First Caribbean International Bank traded 463 units to finish at $8.49, Grace Kennedy concluded trading at $2.82, with 32,514 stock units changing hands, Guardian Holdings closed at $17 exchanging 84,280 units, One Caribbean Media closed at $12.11, after exchanging 163 shares, Trinidad & Tobago NGL concluded trading at $29.50, after exchanging 17,235 shares and West Indian Tobacco ended at $87.90, trading 1,256 units. 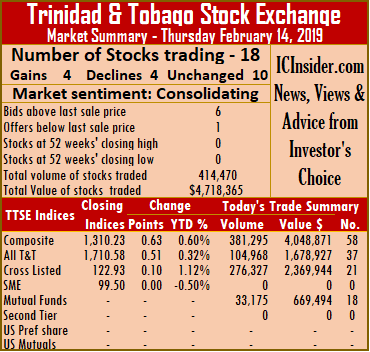 Trading picked up on the Trinidad & Tobago Stock Exchange ended on Tuesday with trading in 18 securities against 16 on Monday, leading to 308,275 shares valued $3,718,664, changing hands compared to 355,041 shares on Monday valued at $3,374,053. Trading closed with 3 securities advancing, 4 declining and 11 remaining unchanged. The Composite Index slipped 0.16 points to 1,223.97, the All T&T Index lost 0.39 points to 1,721.03 and the Cross Listed Index put on 0.01 points to close at 97.61. IC bid-offer Indicator| At the end of trading, the Investor’s Choice bid-offer indicator reading shows market sentiment with 2 stocks ending with higher bids than the last selling prices and 2 with lower offers. Gains| Clico Investments rose 20 cents and completed trading at $20.50, with 37,010 stock units changing hands, First Citizens added 1 cent and ended at $35.01, after exchanging 581 shares and Sagicor Financial gained 1 cent and completed trading at $7.80, with 5,000 stock units changing hands. Losses| At the close, the price of Massy Holdings shares fell 5 cents and ended at a 52 weeks’ low of $46.95, after exchanging 2,341 shares, Point Lisas fell 1 cent and completed trading at $3.80, with 1,104 stock units changing hands, Republic Financial Holdings shed 3 cents and ended at $102.77, after exchanging 3,494 shares and Scotiabank lost 5 cents and settled at $65.05 as 3,996 units traded. Firm Trades| Agostini’s ended at $21.10, after exchanging 10,000 shares, Ansa Merchant Bank concluded market activity at $40, after 349 shares traded, Guardian Holdings settled at $16.51, with 3,190 units, JMMB Group ended at $1.85, exchanging 3,500 shares, National Enterprises completed trading at $9.55, with 10,980 stock units changing hands, National Flour settled at $1.80, with just 100 units trading, NCB Financial Group concluded trading at $5.40, after exchanging 200,000 shares, One Caribbean Media ended at $12, after 4,300 shares changed hands, Trinidad & Tobago NGL completed trading at $29.75, with 19,618 stock units changing hands, Trinidad Cement settled at $2.95, with 512 units and Unilever Caribbean traded 2,200 shares at $29.23. 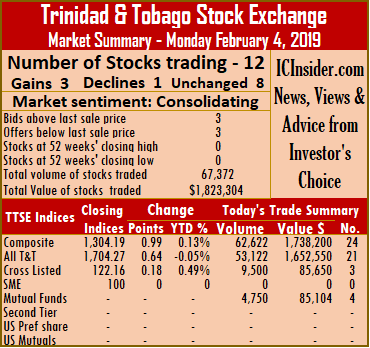 Market activity on the Trinidad & Tobago Stock Exchange ended Tuesday with trading in 13 securities against 14 on Monday resulting in 103,895 shares valued at $1,779,885 changing hands. In trading on Monday only 45,235 shares at a value of $1,152,743, changed hands. At the close of trading on Tuesday, just 2 stocks advanced, 3 declined and 8 remained unchanged. 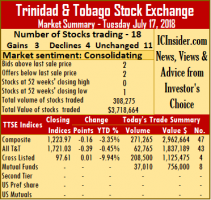 The Composite Index gained 0.78 points on Tuesday to 1,236.41, the All T&T Index added 0.09 points to 1,726, while the Cross Listed Index rose 0.20 points to close at 100.37. IC bid-offer Indicator| At the end of trading, the Investor’s Choice bid-offer indicator reading shows market sentiment to be closely matched between advancing and declining stocks as the market closed with 5 stocks ending with higher bids than the last selling prices and 4 with lower offers. Gains| National Enterprises ended trading after rising 5 cents and ended at $9.55, with 400 stock units changing hands and NCB Financial Group finished 4 cents higher at $5.49, after exchanging 680 shares. Losses| Sagicor Financial fell 10 cents and ended at $7.85, with 32,155 stock units changing hands, Scotiabank lost 1 cent and completed trading at $65, with 1,050 units and Trinidad & Tobago NGL shed 9 cents and ended at $29.51, with 10,901 stock units changing hands. Firm Trades| Agostini’s concluded trading at $21.10, after exchanging 4,402 shares, Ansa Merchant Bank settled at $40, trading 2,000 shares, Calypso Macro Index Fund traded 1,780 shares at $16.50, Clico Investments ended at $20.28, with 15,965 stock units changing hands, First Citizens settled at $35, after exchanging 4,422 shares, Grace Kennedy ended at $3, with 5,000 stock units changing hands, Guardian Holdings completed trading at $16.99, with 25,000 units and Guardian Media 6% preference share settled at $65.06, after exchanging 140 shares. 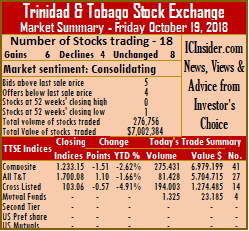 Market activity on the Trinidad & Tobago Stock Exchange ended on Monday with moderate gains in the market indices while in 12 securities traded against 10 on Friday, 5 rose, 1 declined and 6 remained unchanged. The market closed with 200,242 shares trading at a value of $1,592,512 changing hands, compared to just 95,828 shares trading with a big jump in value of $3,162,520, on Thursday. The Composite Index gained 0.50 points on Monday to 1,237.89, the All T&T Index declined 0.07 points to 1,730.43, while the Cross Listed Index added 0.15 points to close at 100.16. IC bid-offer Indicator| At the end of trading, the Investor’s Choice bid-offer indicator reading shows market sentiment to be closely matched between advancing and declining stocks as the market closed with 5 stocks ending with higher bids than the last selling prices and 3 with lower offers. Gains| Agostini’s rose 4 cents to settled at $21.10, after exchanging 175 shares, changing hands, Calypso Macro Index Fund gained 61 cents to close at $15.75 while trading 2,500 units, NCB Financial Group advanced just 2 cents and completed trading at $5.49, after exchanging 30,664 shares, Sagicor Financial gained 5 cents and concluded at $7.95, with 145,330 stock units changing hands and Scotiabank concluded trading with a gain of just 1 cent to $65.01, with 69 units trading. 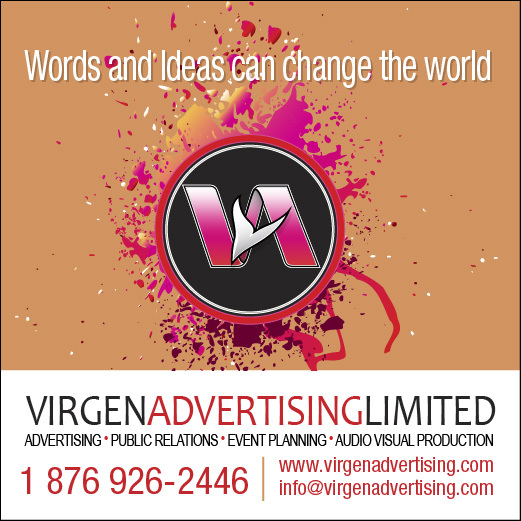 Losses| Prestige Holdings lost 14 cents and ended at $10.01, exchanging 8,273 units. Firm Trades| Clico Investments concluded at $20.25, with 2,445 stock units changing hands, First Citizens completed trading at $34.91, after exchanging 1,695 shares, JMMB Group to finish at $1.75 settled at $1.75, after exchanging 10,000 shares, Massy Holdings to finish at $47 settled at $47.00, after exchanging 371 shares,, Trinidad & Tobago NGL closed at $29.25 with 1,000 stock units changing hands, West Indian Tobacco gained $88.5 settled at $88.50, after exchanging 100 shares.